This is a follow up on a previous post on e-book readers and the future of reading for historical researchers. Emerging digital reading technologies hold great potential to improve historical scholarship, but these developments should not be confused with developments in the consumer electronics industry. New electronic reading devices, including Amazon’s Kindle and Barnes & Noble’s Nook, are primarily directed toward a consumer market to drive sales of mostly works of fiction from commercial publishers. These particular devices are tied specifically to the retail interests of Amazon and Barnes & Noble. By design, they are not, as yet, well-suited for academic purposes. This is not to say that academic historians cannot benefit from digital reading. In fact, historians already do a lot of digital reading through e-mail, websites, blogs, electronic journal articles, and e-books. Digital reading will likely occupy a greater part of historical scholarship in the future, but electronic reading devices like the Kindle and Nook do not currently serve the historian well. Historians cut, copy, paste, and share the things they read. Books purchased through the Kindle and Nook do not support this behaviour very well. Tech-savvy readers will already know many of the issues surrounding the Kindle and Digital Rights Management (DRM) (and the now infamous 1984 incident). Both the Kindle and the Nook offer convenient 3G wireless access (courtesy of AT&T) to very inconvenient books. Amazon offers books in its own proprietary e-book format (AZW) with all the convenience of being locked to your device, courtesy of DRM. This means no sharing, no format shifting, no modifications, and absolutely no copying. E-books from Barnes & Noble offer similar DRM limitations. While the Nook has a sharing feature, this is limited to fourteen days and can only be done once. This is also dependent upon the publisher granting permission for this feature (similar to text-to-speech functionality on the Kindle). You cannot even print a single page from a Barnes & noble e-book. It is little wonder then why so many textbook publishers (excluding a few notable open access textbook publishers) are looking at the Kindle as a very attractive new content delivery system. The magic of DRM essentially eliminates the used textbook market, restricts copying, and accelerates the publication of new editions of textbooks. Getting free Kindles into the hands of undergraduate students serves this emerging electronic textbook industry very well, but does it meet the needs of students, educators, and researchers? All of the DRM-based limitations of e-books purchased through online retailers like Amazon and Barnes & Noble seem moot for academic historians in light of the extremely limited catalog of academic texts available as e-books. As an environmental historian, I am interested in purchasing copies of books by leading scholars, such as William Cronon, Donald Worster, and J.R. McNeill. If I used a Kindle, I could only purchase copies of Cronon’s Nature’s Metropolis, Worster’s biography of John Muir A Passion for Nature, and McNeill’s Something New Under the Sun. I would not find Changes in the Land, Dust Bowl, Nature’s Economy, or The Mountains of the Mediterranean World. If I looked in the Barnes & Noble E-book store, I would find nothing. Ironically, I cannot even purchase an e-book version of Dan Cohen and Roy Rosenzweig’s Digital History: A Guide to Gathering, Preserving, and Presenting the Past on the Web (fortunately, the full text of this book is available as a free website). The problem of the limited selection of scholarly e-books obviously lies on the shoulders of publishers, but one would hope that when more university presses commit to electronic publishing, they will do so in an open manner similar to Athabasca University Press. It would seem then, from the perspective of historians, that the 3G connectivity of the Kindle and Nook holds little value. 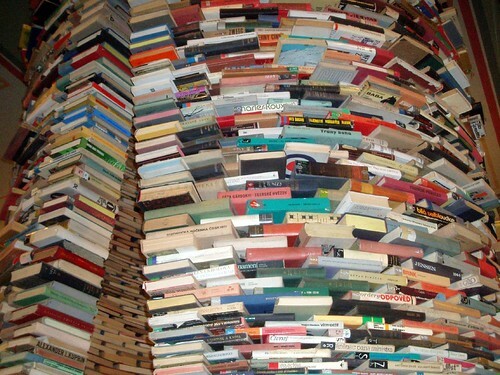 It only offer access to a limited collection of e-books with an abundance of user limitations. Unlike the slow growth in the electronic publication of academic monographs, scholarly journals in the humanities are quickly moving online, primarily in the form of PDF articles available through familiar systems like JSTOR, ProQuest, and EBSCOhost. Leaving aside the restrictions inherent in these systems, historians now read a lot of their journal articles as open PDF files, a style of short-form reading well-suited to digital readers. Historians seem most in need of electronic reading devices that are equipped to read a versatile set of open file formats with simple, file transfer systems. So where do the current e-readers stand on using open formats and simple file transfer systems? The Kindle offers the most cumbersome version of PDF file transfer and reading (unless you use the Kindle DX) while the Nook seems to offer direct file transfer through USB and MicroSD and compatibility with open PDF and other e-book and text formats. 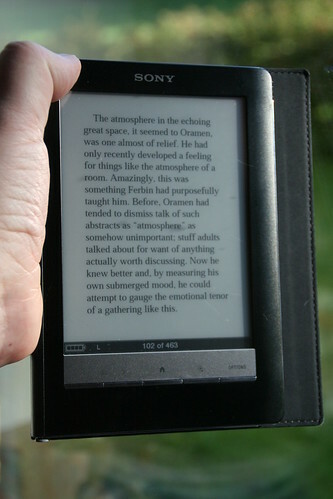 The Sony Reader offers extensive compatibility with many open formats, including ePub, BBeB Book, PDF, TXT, RTF, and Microsoft Word as well as direct file transfer capabilities through USB or memory card. If you use an iPhone or iPod Touch, I would recommend downloading the Stanza and Good Reader applications. Both support a variety of open file formats (although the wi-fi file transfer systems are a bit clumsy to configure and do not work very well outside of a home network). Good Reader is particularly well-suited for reading PDF journal articles and its text recognition function allows the reader to manipulate font size without losing pagination (handy for maintaining proper citations). And, of course, you cannot beat the versatility of the most popular digital reading device, the PC or Mac. The development of new electronic reading devices, however, seems to be a minor issue when it comes to fostering digital reading among historians. More university presses need to digitize their publications and shift the delivery of e-books away from the Amazon and Barnes & Noble DRM models. Scholarly journals need to offer a wider range of distribution options, including RSS subscriptions and multiple open formats. 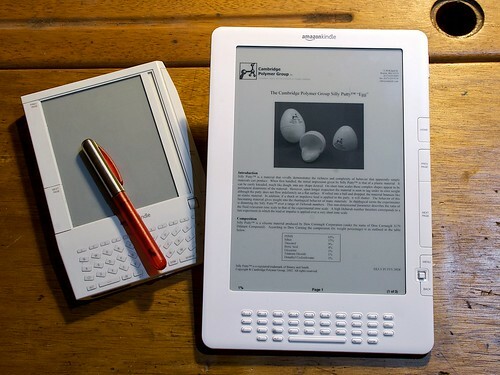 Furthermore, the development of e-reader software user interfaces seems to be more important than the plastic and metal cases that hold this software. Page-turning, bookmarking, text and font modifications, web-integration, and file compatibility are software-based problems that still need to be overcome. These seem to be more crucial problems for digital historians than the emerging hardware wars in the consumer electronics industry. Digital reading holds many advantages for historians and the future of historical scholarship. If we want to expand the use of e-books, e-journals, and other forms of electronic scholarly writing, we must not allow digital scholarly publishing to fall into the limited and ultimately commercially-based boxes of the Kindle and Nook.